OpenStack is today's leading technology for building and integrating public and private clouds. Common OpenStack Deployments is a complete, practical guide to deploying OpenStack and understanding its internals. 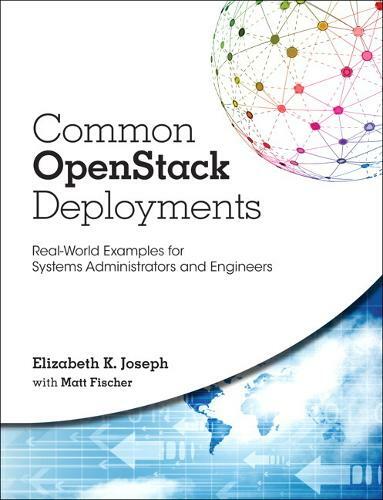 Key project contributor Elizabeth Joseph, with expert implementer Matt Fischer, shares up-to-date recipes for deploying OpenStack on both virtual and physical servers, and for using OpenStack to address any real-world challenge. First, Joseph and Fischer help you master OpenStack concepts and components by guiding you through small-scale, virtualized deployments. As you deepen your understanding, they guide you through building large, horizontally scalable infrastructures that integrate multiple components in a feature-rich cloud environment. Throughout, you'll find up-to-the minute coverage of enhancements that make the OpenStack platform more mature and production ready, plus expert tips on debugging and growth. Common OpenStack Deployments is the ideal resource for all network and data center professionals who want to apply OpenStack in proof-of-concept or in production, and for every instructor or student who wants to leverage today's hottest cloud technology.